Organic, Extra Virgin Olive Oil: Olive oil has been used in body care for generations. It is known for its healing qualities and as a natural, deep penetrating moisturizer, regenerating skin cells and softening the skin. It adds smoothness and softness to dry, flaking skin. Sweet Almond Oil: Almond oil is an excellent emollient that leaves the skin soft and supple as it is readily absorbed into the skin. Almond oil is full of antioxidants and has also been shown to reduce dark circles around the eyes. The Lavender Hand and Body balm has a high amount of almond oil in its ingredients. 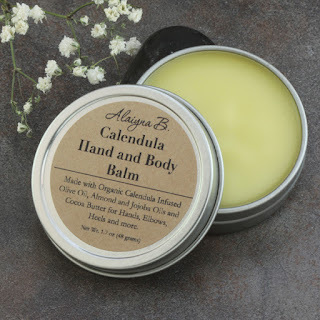 Organic Calendula (infused in the Organic Extra Virgin Olive Oil): Calendula (Calendula officinalis) also known as Marigold, has been used for many, many years in treating and nourishing skin. Oil infused with herbal calendula is successful in healing dry and damaged skin, in addition to many skin disorders and rashes. Great for eczema, rashes, cracked and inflamed skin and sensitive skin as it is very mild and soothing. Jojoba Oil: An amazing oil for softening the skin and used to promote softer, more supple skin. Jojoba Oil is easily absorbed by the skin and helps to nourish and prevent dryness. The structure of jojoba oil closely resembles that of your own skin sebum and is readily absorbed. It also balances the production of sebum which is your skin's own lubricating medium. Cocoa Butter: Cocoa Butter is frequently used for treating dry skin and is a beneficial treatment for chapped hands, feet, lips and other skin irritations. Olive Butter: Olive butter has the same skin care properties of olive oil but comes in a firmer, more spreadable form which makes it great in balms. Vitamin E Oil: A great antioxidant. Peppermint Essential Oil: Peppermint oil gives a nice cooling effect and wonderfully uplifting scent. It nourishes dull skin and improves oily skin. Lavender Essential Oil: Lavender Essential oil is an antiseptic and anti-fungal which helps to reduce scarring and speed healing. It is considered a universal oil because of all of its benefits. It also provides a soothing and relaxing scent. I absolutely love your blog and find most of your post’s to be exactly I’m looking for. can you offer guest writers to write content for you personally.